Antonio Conte oversaw Chelsea’s first full pre-season training day on Monday, amid uncertainty over his future. 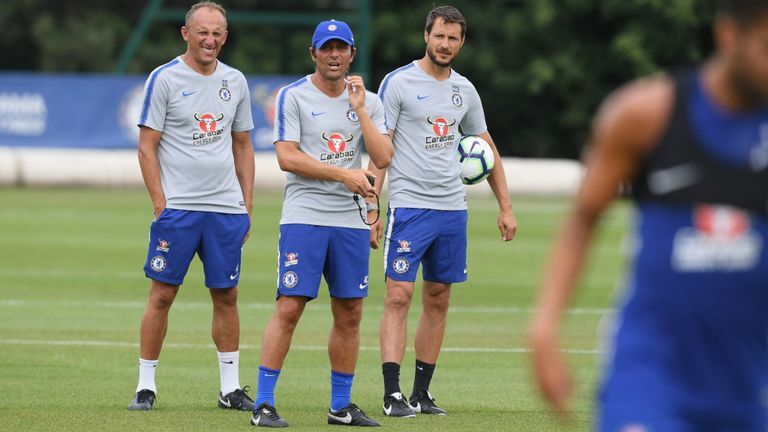 Conte and his backroom staff were at Chelsea’s Cobham base on Saturday morning as some of the squad returned to training, according to Sky in Italy. Ross Barkley, Cesc Fabregas, Marcos Alonso, and David Luiz were among those pictured alongside Conte on the club’s official social media channels on Monday as he led a full session for players not involved at the World Cup in Russia. The Italian has one year remaining on his contract at Stamford Bridge. But Sky in Italy understands negotiations between Napoli and Chelsea over Maurizio Sarri’s appointment as Conte’s potential replacement are in a deadlock. Napoli president Aurelio De Laurentiis is waiting for an improved offer from Chelsea and Sarri is not in London, as he waits for the go-ahead. Napoli is due to start pre-season training on Tuesday, with Sarri remaining officially in charge – although former Chelsea boss Carlo Ancelotti has signed a three-year deal to take over.